In the NFL, having a truly GREAT QB makes all the difference as a coach. Find a Brady, Manning (or Nick Foles baby!) and whatever you do as a coach becomes much easier. In lacrosse, a GREAT goalie can have the same effect, and for 4 years I was fortunate to get to work with a truly elite goalie in Brian Neff. Brian ended up with us at Ursinus College after getting numerous Division 1 looks, and he immediately got to work. After a great freshman year that saw him finish in the Top 10 of most statistical categories, Brian graduated as a 3-time All-American and Player of the Year while leading his team to new heights. Brian is a gifted athlete and was always one of the best athletes on the field, regardless of position. But Brian worked harder than most throughout his 4 years to maximize his talent, and to translate that athletic ability into a dynamic, explosive style of play where he truly exemplified being a “playmaker” in AND out of the cage. As a coach, there’s nothing better than getting to work with someone who is not only gifted but also driven to improve. 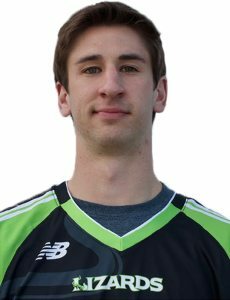 So when Brian was selected by the NY Lizards in the MLL Supplemental Draft, we were excited to get back to work with him and get him ready! -Brian is 6’3” but notice how he is always working to get his “nose on the ball”, even on shots down low. He gets low and on top of shots at his feet, avoiding the tendency to be lazy and “reach” down for these. -When Brian steps, notice how he really drives off his back foot and then gets his whole frame moving to the shot. We want to work on this, as opposed to reaching with our front foot and leaving the back foot behind us, forcing us to LUNGE rather than STEP. -Notice Brian’s feet right before the shot. One thing we’ve focused on over the years is trying to ALWAYS have his feet settled pre-shot, avoiding minor adjustments or “happy feet” as the shot is about to be released. No wasted movement!